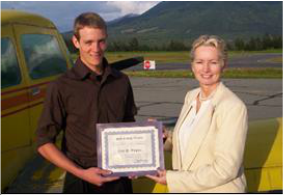 Cory Wagner (Wasilla), Branden Forst (Sitka) and Hailey Summers (Juneau) exemplify the attitude and commitment which the Forrest Jones Memorial Scholarship seeks to perpetuate in Alaska aviation. Each were awarded a $1000 scholarships for 2008. At five years old, Cory Wagner began to dream of flying. The dream began after he flew to visit his grandparents and extended family in Illinois. He shared that dream with the Alaska Air Carriers Association, which is honoring Cory Wagner with the 2008 Forrest Jones Memorial Scholarship. Ever since he was a little boy, Branden Forst of Sitka has looked up to watch planes flying overhead and thought, “I sure wish that I could fly one day and be looking down instead of up.” He shared that wish with the Alaska Air Carriers Association, which is honoring Brandon with the 2008 Forrest Jones Memorial Scholarship. The Alaska Air Carriers Association scholarship committee commends Branden for his demonstrated character, self-motivation and the good grades he worked to receive. Dan Langbauer, Branden’s math teacher for four years at Sitka High School wrote, “First and foremost, he is a quality human being. Branden never has a bad thing to say about anyone, is very positive, and always has a smile for people. Though he is very soft spoken, people respect him as a leader. Branden has distinguished himself as one of the top trumpet players both locally and throughout the state. The thing that separates Branden from many of his peers is his work ethic. Branden knows what it means to work, and there are many times when he is in school before 6:30am to get extra help on math, physics, or practice a particularly difficult music piece.” Branden’s father, Rich Forst, has his pilot’s license and flies the family Aviat Husky on floats throughout Southeast Alaska. Rich has taken the time to teach Branden “everything from how to tie a plane down to how the different instruments work.” Branden says, “When I was seven, I remember sitting in the cockpit of an Alaska Airlines 737-400 in awe of all the switches and instruments around me.” Branden was born in Sitka and celebrates all that living in Alaska offers, spending much of his time outdoors hiking, mountain biking, hunting, boating, fishing, scuba diving and kayaking.“When I was twelve, my brother and I would take our thirteen-foot whaler out to go fishing or camping.” Branden obviously has a vision, works with purpose, and achieves his goals. This year through the U.S. Coast Guard Branden became a licensed U.S. Merchant Marine Officer and Master of steam or motor vessels of not more than 100 gross tons. In addition, he is a state-certified Emergency Trauma Technician and a certified PADI Rescue Diver. Branden is enrolled in the California Maritime Academy in Vallejo CA studying Marine Transportation. Brandon is combining marine and aviation studies with flight lessons to build a firm foundation on his way to achieving his dream of becoming an Alaska State Trooper Fish and Wildlife pilot.